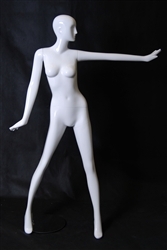 Donna White Female Mannequin 5'6" tall comes is gloss white with an abstract head and looks great in any type of display. Use for your smaller sizes and she is a pettite mannequin. Also could use her as a teenage female as well. Donna White Female Mannequin is made of fiberglass. Available for pre-order. Height - 5'6" or 66"
Includes base and 2 supporting rods - for foot or calf.